T-Mobile has made it very clear that their strategy is to promote friends and families. What better way is there to stay connected with these friends and families than by using those crazy social networks that the kids seem to love these days. Oh, right…I guess we could make some phone calls, but who wants to do that (it’s the 21st century people, I mean really). 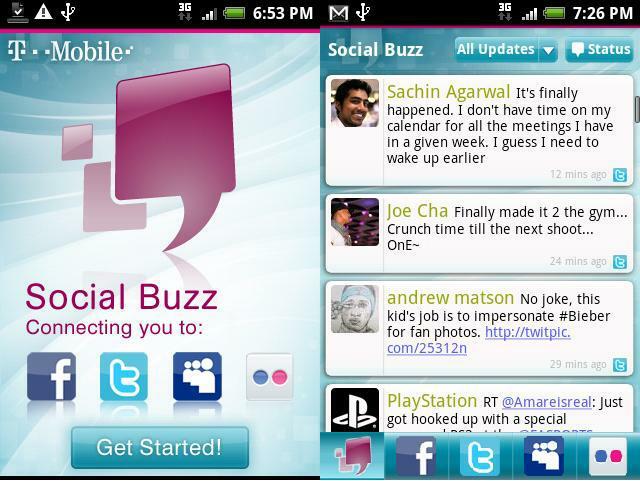 Anyways, T-Mobile is getting into the social network game by introducing a new Android App, aptly called Social Buzz. 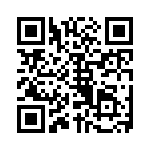 This app combines Facebook (become a fan of us) , Twitter (follow us), MySpace (wait, this is still around?) and Flickr, all into one simple app. Speaking from some first impressions, it is pretty nice and convenient, though a widget would make it great. The downside? This app is only for Android 2.x devices, so some of you will need to wait (or root). So go ahead and give it a try, then leave your thoughts in the comments! BULL CRAP Why only 2.x and up ! They Can Stick This App Up Wherever It FITS BEST! Magenta Needs Hurry Up And Update myTouch’s ASAP. Just root your mytouch and install a 2.1 Rom. Custom 2.1 Roms at this stage in the game are very stable for the Mytouch and the G1, so there’s no reason why you should still be at 1.6.
http://forum.xda-developers.com/showthread.php?t=682243 Here is the link to the XDA Forum on how to root and install a updated rom on your MyTouch. Believe me it’s easy. I could root your phone and install a 2.1 rom on your phone in 5 minutes. With a little reading, you should have it in a few hours. WAIT WAIT WAIT!!! It is for Android 2.x?!?!? TMO only has the Slide that is 2.x right?? So like what 99% of their customers can’t use it. Next month the MyTouch 3G is supposed to get 2.2. I have a Nexus One that has 2.2. I hate social networking, its for mindless automatons. My phone has a Facebook app that wont uninstall and I want it off now ! if you hate social networking then why are you posting that you dont like social networking on a site that has it by posting you dont like it?????? ?you in fact are social networking by doing so..
Social Buzz is not only an ANDROID app , it is already on the 3 new qwerty Samsungs that came out recently. Decent app, but kinda useless on MT3G Slide since it already has tight social networking integration via sense and it’s widgets. If you’re running htc sense, friendstream pretty much does the same thing but I’m gonna give it a whirl anyways. It’s like T-Mobile is in denial. I wonder what the gain is for Tmo? App is free right? Are there tmo adds? I want to root my Cliq to get it at 2.1. Any suggestions? Send me a Tweet, my name is @jaehood2010. Please!!!!!! can’t wait to run a sense rom on my shiny vibrant!!! i hate that i’m missing out on a good flickr app and tumblr app on android but other than that, it’s the best mobile OS out there!!! Installed yesterday. You can’t disable background sync, and it is slow on the myTouch 3G (Cyanogen 5.0.8). The background sync irritates me – I don’t need to be alerted every time someone posts something, and I value my battery life. I set the refresh time to the max of 4 hours. Social Buzz is installed on my kids Gravity T’s that I picked up for them, and they are not Android phones at all..its just an app that combines all the social network things..they love it, and I love that I got them a great phone and only pay 10 dollars/month for their internet instead of getting stuck with 30 dollars for the Android phones..
Nice review, I’m loving these barcodes with easy access to apps on the Market! does anyone know if and how this app can be installed on the Nokia Nuron? I figure if it can be put on the Samsung T them maybe i can get it on the Nuron. um… I don’t think this is only for android. There may be one for android but the Sentio, Gravity 3, T & Smiley all come with this on the phones. I like the idea of the app. I think social sites are loosing a little popularity. Of course they may still be a big deal for teens. Most people I know kind of kicked wanting to update and maintain multiple social sites and just stuck it out with one (usually one that all friends use). I think it is great T-Mobile keeps making apps. Gives them a slight edge with Android devices to have their own App selections. I would enjoy the humor in them charging other carrier devices a fee while pre-loading their apps for free on their own android devices. Can anyone recommend some similar apps? I’ve used eBuddy which lets you chat on msn, facebook, yahoo, aim, icq, gtalk, and myspace, but it doesn’t handle the updates so much though, it’s just chat. I’ve looked at a few meta-updaters such as Cellspin and Moby, but I don’t like the way they post updates. They often post an updated to some third site, and then just post a link to it in each site you wish to update. I want native updates to each network. Another question… is this for Tmobile users only, or can anybody use this app? come on TMOBILE get 2.x to My touch phones……time to leave Tmobile? ?